A new Warbird Virilage and classic aircraft column, with Alex Mitchell. Part one of a two-part reflective series by Mike Feeney on Hamilton's Control Towers - 1940s to 2004. It's said that to make a small fortune in aviation, you must first begin with a large one. With fierce competition and costs that can make an oil baron gasp, making a mark in aviation can be difficult at best. What you need is something different, something unique. Christchurch-0based company HeliConcepts has found what it thinks is an answer - innovation. Story by Callum Macpherson. Hundreds of dollars an hour for teams of men on the ground or thousands of dollars an hour for a helicopter - which is cheaper? Why the helicopter of course! Rob Neil recently spent time with one of the country's most experienced operations and found out why when he saw the thirteen blades of Keith McKenzie's venerable Huges 500d in action. Big moves are afoot in New Zealand's gliding community. Rob Neil visited Omarama recently to find out what's going on and took the opportunity to experience the absolute essence of flight in one of mankind's most beautiful creations - the modern fibreglass glider. 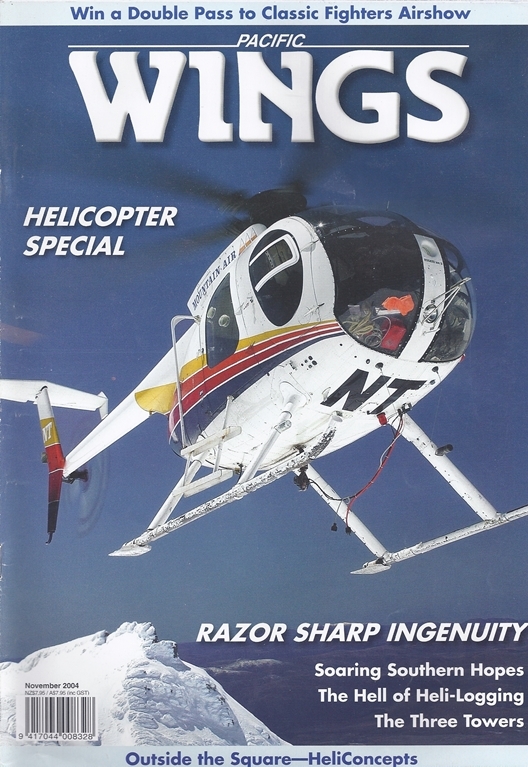 Pacific Wings talks with Stratford's Mark Ford, owner of Heli-Logging, about his frustrated attempts to put his ten-strong fleet of Wessexes into service as specialist heavy-lifters.